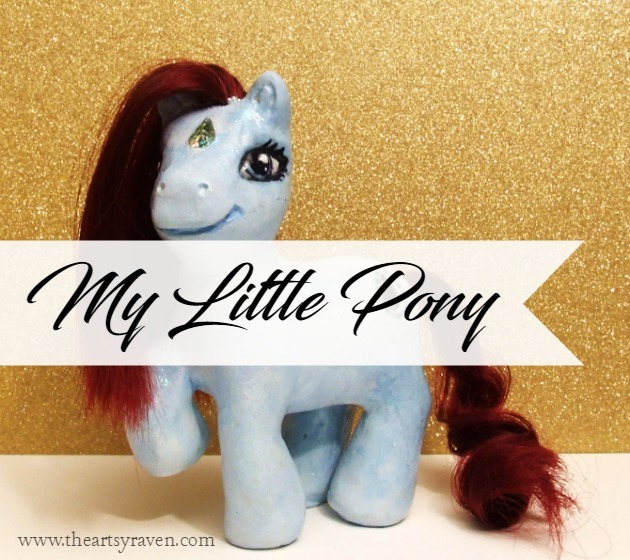 My sister-in-law loves My Little Pony, I don’t know how much she loves it now but a few years ago she adored that show, so I decided to make something special for her birthday. I had seen a few custom made ponies around the internet and knew even before deciding to give my sister-in-law one that I wanted to try out something similar. I tried to make it for her her birthday that same year, but it wasn’t complete until almost her birthday the following year, that's so typical for me. Up until then the only pony I've seen was a happy meal pony I received when I was really young, and because I can barely remember it I decided to buy one to use it as a template. 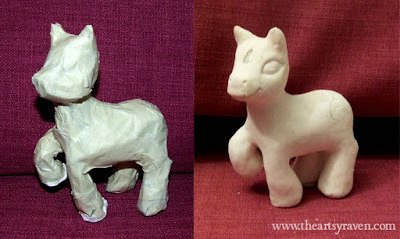 I actually found a blank pony on ebay, which I'm sure is for customization, but I would use it as a template as I wanted to make the pony from scratch. Using the blank base as a model I built the body of my pony with aluminium foil and tape. As I often do I jusmped straight into crafting without bothering to do a little research, I learned a few things I will not be repeating if I decide to make another pony. Once I was happy with the base I covered it with white clay, then it was time to design the pony. 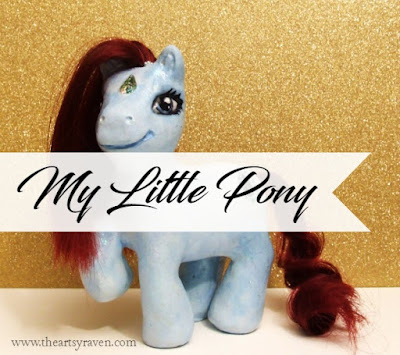 The only thing I had planned until then was that the pony would have red hair like my sister-in-law, other than that the design was coming to life as I worked on the pony. I asked her once what her mark would be if she was a pony, hoping it would help me in the design, but she didn’t know and so I had to come up with my own design. Looking through my craft supplies I decided to go with a glass gem instead of a painted mark, and to spice things up I decided to give the pony a gem on its forehead as well, because why not. 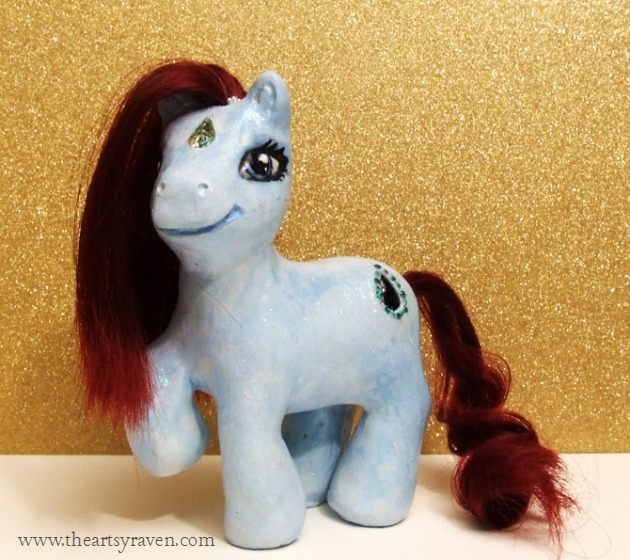 My sister-in-law has a sparkly personality which helped me decide on the colour of the pony body, which I covered in a thin layer of sparkly polymer clay. 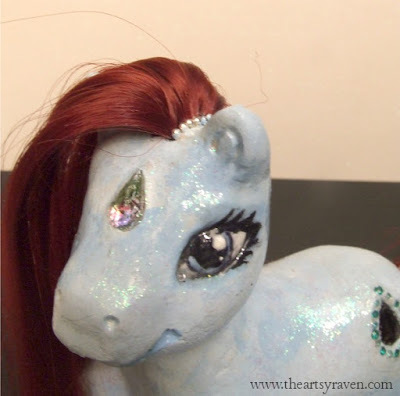 I added several small details on the pony, like the tiny gem in the corner of her eye, the small glass beads around her mark, and head pins down the roots of her hair. The head pins weren’t originally going to be there, but I messed up the holes on the head and had to cover them somehow, luckily I think it looks good. I am happy with how the pony turned out, and my sister-in-law was happy with it as well, once she received it that is. If I do make another one in the future I know which mistakes not to repeat, so I should be able to drastically cut down the craft time.